How do kamado smokers work? What to consider when buying a kamado smoker? On our kamado smoker reviews, we have set out to discover the best kamado smokers out there. Among the five smokers we picked, it is rather difficult to point out the best. The “best” is very relative: what may be good for one could be bad for another. All five smokers are right in their way, and each has its buyer category. And with that logic, we were able to select Grill Dome smoker as our top pick in the end. It has a right balance of cooking capacity, price, and convenience, which is why we think it is the best. A kamado smoker is a type of charcoal smoker in a sealed ceramics body. Kamado smokers very often function not only as smokers but also as ovens or grills. 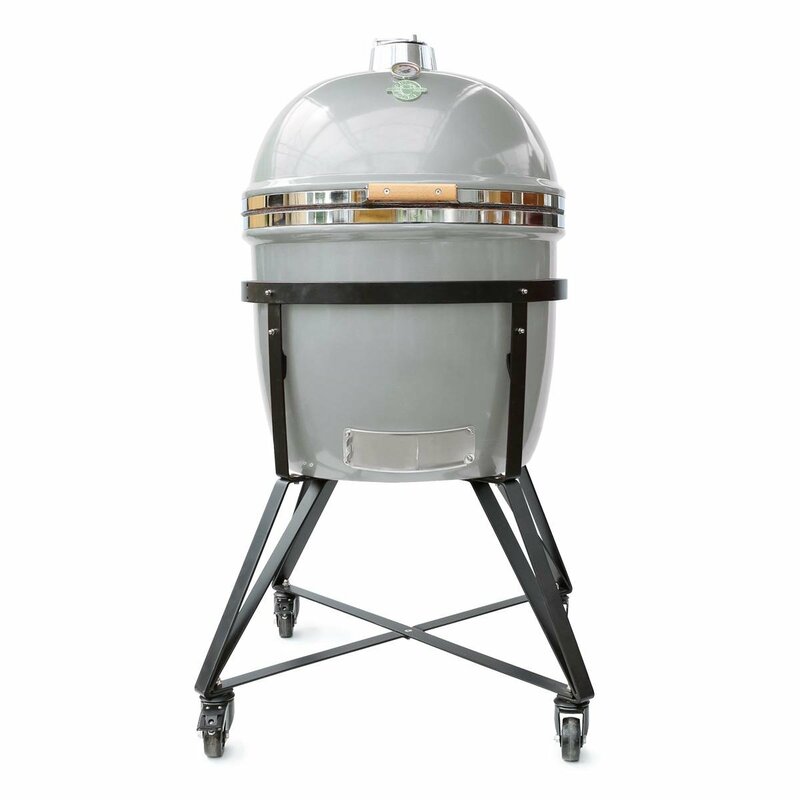 Kamado smokers have distinct advantages and disadvantages over other types of smokers. First of all, being technically charcoal smokers, kamado smokers deliver an excellent smoky meat flavor. However, because of their unique features, kamado smokers can provide even more delicious meat than a charcoal smoker would. We’ll explain why in a moment. Kamado smokers also hold the heat inside very well, which makes them ideal for extra-slow cooking and smoking. And besides, because they are nearly fully airtight (only their intakes and exhausts are open), they can be easily used in cold areas or winter. On the other hand, kamado smokers typically are much more massive than their charcoal, propane, and electric counterparts. In spite of this, kamado smokers are usually very fragile and can crack easily. Well, that’s the case if you’ve got a ceramic kamado smoker. We would advise you to go for one since they are the best when it comes to smoking. We’ve already mentioned that kamado smokers are essentially charcoal smokers. However, they can produce a much better meat flavor. Very well insulated thanks to their full sides, kamado smokers need less charcoal and oxygen to work. As a result, the airflow out of the smoker’s chimney is considerably reduced. As the meat heats up, a lot of liquid evaporates from its surfaces. And the stronger the airflow in the smoker, the more the meat dries out. Pork shoulders, for example, may lose as much as 30% of their weight in an offset smoker. In a kamado smoker, water loss often does not exceed 20%. Because kamado smokers have low airflow, the evaporation in them is very reduced. Finally, you get meat that is noticeably juicier. Not that charcoal smokers can’t smoke great meat, but if you want to try out something new, a kamado smoker will allow you that. In kamado smokers, the meat is also usually higher up above the coals, which prevents flare-ups that often spoil the meat. Another advantage of kamado smokers is that they retain heat in them very well. Because ceramic walls are so well insulated and absorb and radiate heat so efficiently, kamado smokers are exceptionally good at holding steady temperatures for a long time. The excellent heat insulation of kamado smokers has one downside as well though. That is, it limits what kind of cooking you can do. This disadvantage doesn’t concern smoking, but if you plan to grill, bake, or roast food in a kamado smoker, then you’ll probably have a hard time. So, the thing is that 2-zone cooking in a kamado is complicated. Due to the heat retention capabilities of ceramics, it is nearly impossible to separate a kamado in 2 cooking zones with a 100-200 degree Fahrenheit temperature difference. Much cheaper charcoal grills and smokers do this quickly, but they, on the other hand, don’t retain heat nearly as well. It should be noted though that this disadvantage mainly concerns round smokers. Oval smokers can do the 2-zone cooking, albeit they may be less efficient at it than regular charcoal smokers. A thing that isn’t a downside is that kamado smokers tend to heat up slower. If you’ve got some time to spend, then this won’t be an issue for you. Besides, once the walls do heat up, it will take a very long time for them to cool down, which is another thing that contributes to the thermal efficiency of kamado smokers. Again, this also is a double-edged sword: for example, if you overshoot your target temp, it may take you some time get it down to the desired level. There is one thing that you need to know about kamado smokers. Because they are almost airtight, the coals may starve for oxygen during shutdown or at low temps. If you at this very moment open the lid of the smoker, oxygen will rush in, causing a fireball that may seriously injure you. So, when dealing with kamado smokers, make sure to be extra careful. When opening a kamado smoker, wear fire-resistant gloves, first of all. Then, to prevent any fireballs or whatnot from forming, you should open the top damper very slowly and keep it like that for a minute. Open the lid slowly, standing to its side rather than in front. Even if you are sure that there will be no flashovers, you should be very careful when opening a kamado smoker. The main thing you’d want from a kamado smoker is probably cooking area. And indeed, it’s a critical spec to consider. When choosing a kamado smoker, you need to make sure that it has enough cooking area so that you can smoke or grill as much food as you need. As a general rule, you would need a standard 9.5-inch kamado smoker if you usually are cooking for only a couple of people. But if you are planning to do a lot of large parties, then something sized 24 inches or more would be the better choice. Besides, keep an eye out on the cooking area of kamado smokers. With those numbers in mind, you should be able to quickly learn how much food you can fit in the smoker. The size of the kamado smoker is also an important feature to consider. First off, the bigger the smoker, the more smoke it can keep inside during the cooking process. If you love strongly smoked meat, then you would want to go for a more heavy kamado smoker. Do you like just a hint of a smoky flavor? You would need a smaller kamado smoker. Aside from the amount of smoke kept inside, you would need to take into account how much free space you have for a kamado smoker. You should have enough storage area for your smoker, after all. While the traditional element in kamado smokers is ceramics, you may want something else to buy. Do you have a limited budget? You would probably need to go for a kamado smoker made from a material other than ceramics. As we have already mentioned in the beginning, ceramic kamado smokers are quite expensive. These days, kamados are made from either ceramics, aluminum, or stainless steel. All these materials are very close to each other regarding temperature control. What differs is their durability, weight, and looks. Ceramic kamados are durable and corrosion-resistant, but they are also fragile. Besides, they are too much more substantial. On the other hand, aluminum cast or stainless steel kamados are much lighter and aren’t fragile, but they may be prone to corrosion. The best kamado smokers are mostly made from ceramics, so if you want to get the best smoky flavor from the meat, then you would need to invest in an excellent ceramic smoker. What kind of instruments and attachments come with the kamado smoker is also quite important. Because kamado smokers are expensive, many manufacturers sell bare kamados with few to no accessories to reduce their price. This is a thing that you’ll need to consider. At the same price, a kamado that comes with no accessories will tend to be better than one that comes with them. To be able to choose the best kamado smoker on a budget, you would require to think what is more important to you: the quality of the smoker or the number of included accessories. 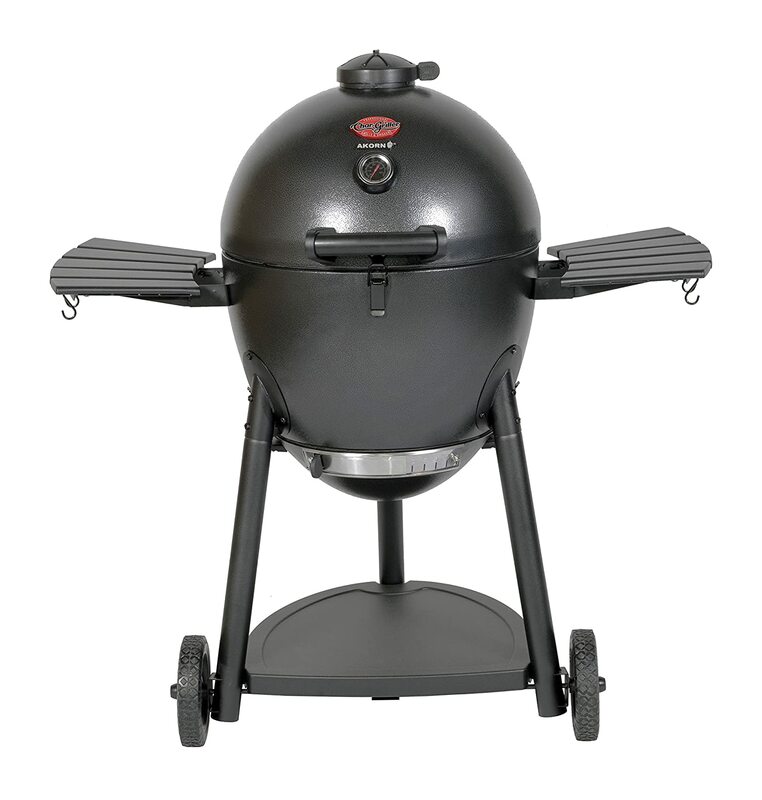 By now, you already realize that picking a kamado smoker with the right price-features balance is very important. Do you have a limited budget? Think to give up on something, be it materials, accessories, or cooking area. Determining what price point is right for you is the first thing you should do. If you know your limit, you’ll be able to shortlist the too expensive kamados and save a lot of time while searching for that best ceramic grill. To achieve our goal of identifying the five best kamado smokers and then ultimately choosing the best of the best smoker, we have first conducted in-depth research on kamado smokers. They are pretty similar to charcoal smokers, but some delicate details made them completely different. You’ve seen the results of our research above. Armed with that ideas, we set off to shortlist five superior kamados. Our task was to identify those that had the most optimal balance of price, features, and durability. After going through numerous user reviews, dozens of kamado smokers and their features, we have identified the five models that we think are the best kamado smokers out there. We then thoroughly examined their features to draw a comparison between them and try to understand what kind of buyer categories each of them would be suitable. And having found the answers to our questions, we are ready to share them with you. Char-Griller Akorn kamado smoker is a pretty lovely entry-level smoker. It isn’t the cheapest smoker we reviewed, but it still is pretty affordable. The size and the cooking capacity of the Akron smoker catch the eye first: it has got 447 square inches of a combined cooking area. Remarkably, the Akorn smoker is the more convenient smoker on the list: it has got two foldable side shelves with tool hangers, as well as a roomy bottom shelf. Those aren’t that essential in kamado smokers, but it indeed is nice to have such things. For the money, Akorn kamado smoker delivers, though it would be nice if Char-Griller didn’t suffer from any shipping issues: many buyers complain that the smokers have arrived dented. 447 square inches of cooking space. Has three shelves with tool hangers. Char-Griller Akorn Jr. is pretty much the smaller version of the Akorn kamado smoker we have just reviewed. This implies both some advantages and disadvantages. First off, Akorn Jr. could be a good choice for those on a limited budget: this kamado smoker is the cheapest on the reviews. Secondly, because it is much smaller than the sizeable Akorn smoker, it is much lighter, weighing just 37 pounds. Thanks to this, Akorn Jr. can be relatively easily carried by hand, albeit some people may still need a couple of helping hands to transport this thing. On the other hand, small size means smaller cooking capacity: this smoker has just 153 square inches of primary cooking area. This isn’t a downside though if you don’t need more. If you like this smoker, then keep in mind that it tends to rust quickly, unlike the elder Akorn that probably just has better materials. Thereby, humidity would be the enemy of this little guy. If the best kamado smoker for you would be the one that is reasonably priced, then this one may interest you. Out of the box, Pit Boss Kamado smoker has the largest cooking capacity among the smokers we examined. This smoker boasts 567 square inches of cooking area, partly thanks to its two-tier cooking grate design. For large gatherings, Pit Boss kamado smoker is thereby excellent. Like the Akorn smoker, this one has two foldable bamboo side shelves. However, the shelves don’t have any tool hooks, so this smoker didn’t manage to surpass the cheaper Akorn regarding convenience. Props to the Akorn for this. However, this smoker is made from ceramics, so it is more durable and isn’t prone to corrosion. And that’s a big plus. The sad thing in this smoker is its lower vent. It’s slightly loose and thus not 100% airtight when closed, so you may need to use a hammer to make it work. 567 square inches of cooking surface. The bottom air vent is loose. If appearance is an essential thing in kamado smokers for you, then Grill Dome smoker may interest you. This smoker indeed looks very unusual for a ceramic kamado smoker! It isn’t exactly elegant, but it seems a bit cleaner than typical ceramic smokers. 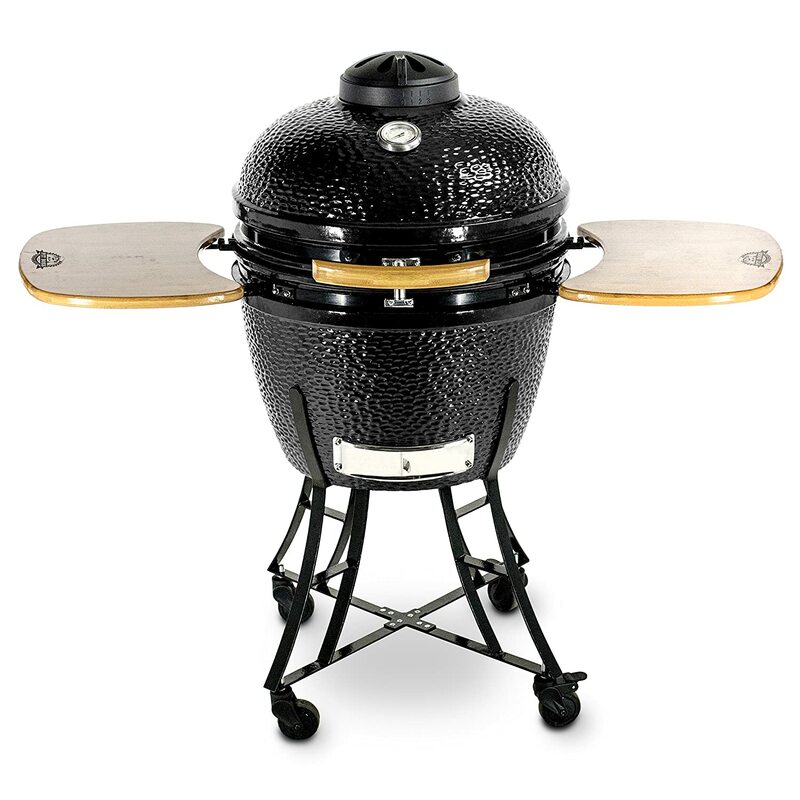 Grill Dome boasts that this smoker is made from Terapex ceramics. Whichever kind of ceramics that material is, it certainly delivers better results than the cheaper smokers we reviewed. As expected, given the price of this smoker. And besides, the components of this smoker are made from stainless steel to prevent rusting. The cooking capacity of the Grill Dome smoker is very lovely: 380 square inches. It won’t be able to supply the largest parties, but it should be sufficient for full family gatherings. 380 square inch cooking area. The finish isn’t very durable. The last smoker on our ceramic grill reviews has the most “potential” cooking capacity. Out of the box, it comes with 400 square inch cooking area, but it can be extended to 680 with rack extensions. 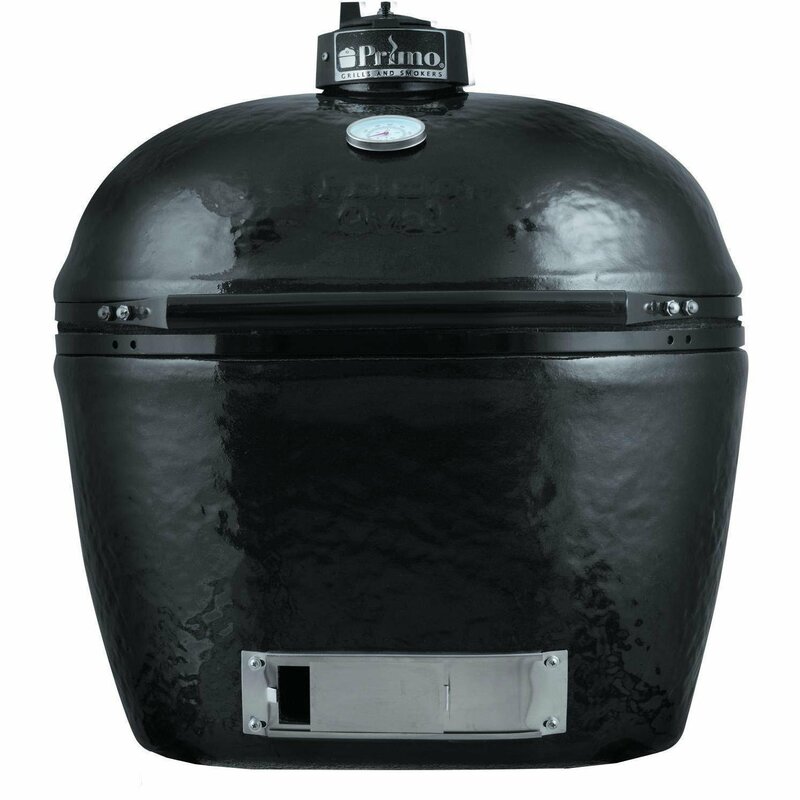 So if you are looking for a considerable kamado smoker and can afford rack extensions, then Primo smoker could be the right pick. 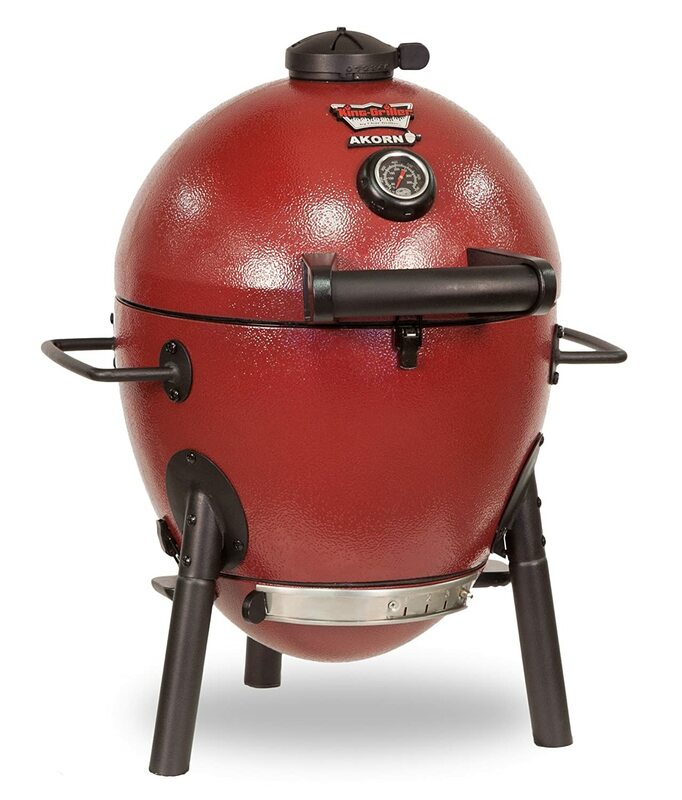 Aside from the expandable cooking area, what is also remarkable in this smoker is its oval shape. All of the other smokers we reviewed have been round, as you probably noticed. As we’ve explained earlier, oval kamado smokers can be used for 2-zone cooking pretty well, albeit probably not as effectively as with regular charcoal smokers. Nonetheless, that’s another plus for Primo smoker! All this is good, but this smoker has one big downside. It doesn’t have any carry handles or wheels. And the worst thing is that it weighs about 200 pounds! You could pay more to get this smoker with a wheeled table. But if you don’t have the budget, then you’ll have to find some people to help you carry this monster. 400 square inches of cooking area, extendable to 680 with rack extensions. The oval shape allows two-zone cooking. Difficult to carry: has no handles or wheels.